This safari tour is everything that you have wished for. You will have the chance to mingle with the most amazing wildlife that Kenya has to offer. 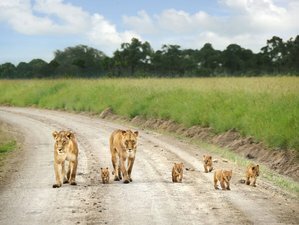 Maasai Mara, home to various kinds of animals, is an enormous national park and you will get the chance to witness one of the seven wonders of the world - the Great Migration. Enjoy the most dramatic episode which is the perilous crossing of the Mara River by thunderous swarms of wildebeests. In Lake Nakuru, you will visit a sanctuary, home to a colony of about 25 white and black rhinos. Create unforgettable moments among the wildlife of Maasai Mara and Lake Nakuru! You will be accommodated in a double room for two nights at a camp in Maasai Mara National Reserve and the last night will be spent at Golden Palace Resort in Nakuru. Please note that triple room is also available. This morning, you start your safari by driving through the dramatic Great Rift Valley to the Maasai Mara National Reserve. This enormous reserve is actually part of the vast Serengeti plains famously known for its spectacular great wildebeest’s migration and is home to the Big Five: lion, elephant, leopard, buffalo, and rhino. Lunch at the lodge and you will have the chance to relax before departing for the afternoon game run. The Maasai Mara National Reserve is one of the greatest wildernesses in the world. Large mammals are varied and easy to see. Residents of the park are Maasai giraffe, buffalo, eland, and thousands of plains game including impala, zebra, topi, both Thomson’s and Grant's gazelles. The search for great predators and, perhaps, even cubs continues today during extensive game runs. On the plains are enormous herds of grazing animals plus the elusive cheetah and leopard hiding amidst acacia boughs. During your stay, you also have an optional opportunity to visit a village of the Maasai people to witness the singing and dancing that are part of their daily lives and sacred rituals. A glimpse into their homes and social structure is a poignant experience. Enjoy a pre-breakfast game drive between 06:30 and 09:00 and you will return to the campsite for a hot breakfast afterward. After breakfast, proceed to Nakuru. Dinner and overnight stay will be at Golden Palace Resort which is a budget hotel in Nakuru. After breakfast, proceed for a game drive in the rhino sanctuary which is home to a colony of about 25 white and black rhinos. Predators are also resident in the park. Later, you will leave for Nairobi after lunch. This is the end of the safari. The safari will take place in Maasai Mara National Reserve and Lake Nakuru National Park in Kenya. You will be served three breakfasts, four lunches, and three dinners. Bottled water will also be served during the safari. Please book your flight to arrive at Jomo Kenyatta International Airport (NBO). Transfer from and to the airport is included. Wild Streamer Tours and Safaris will pick you up from the airport. Wild Streamer Tours and Safaris is Kenya's top safari tour operator with a big list of quality Kenyan and Tanzanian safaris at pocket-friendly prices.